Talented professionals with many years of experience that will assure your Big Day will end memorably. 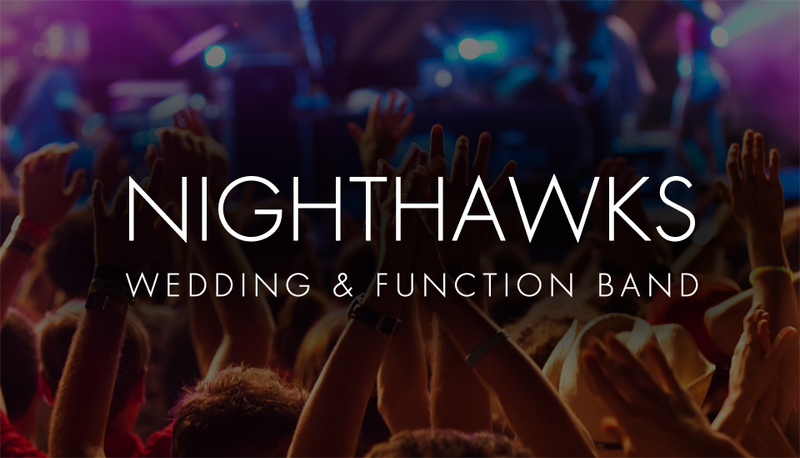 Nighthawks are a wedding/corporate/functions band based in the West/Midlands. Our aim is to provide top quality entertainment at every event we play. The band specialises in weddings/ corporate functions/private parties and large pub gigs, and perform nationwide. What makes us unique is the effort put in to every show. The band brings a huge amount of musical experience and expertise to make your function go with a bang. Covering all Genre’s from Trad to Rock, Pop, soul, etc. with all music tastes catered for, with all music played 100% live. Bringing with them a range of instruments and talents, including percussion, bass, acoustic guitar, electric guitar, whistles, mandolin, fiddle, keyboards and synthesizer you or your client are guaranteed a great nights’ entertainment! * This is a FREE service, there are absolutely no fees, commissions, hidden charges or otherwise, and Nighthawks will respond directly to you. We respect your privacy, you are not signing up for a newsletter or spam, and your enquiry goes only to Nighthawks. Ye truely are the most energetic fun wedding band and we cant recommend or thank ye enough, no song was a problem to sing for ye, anything we wanted ye done, so professional and easy to deal with, we couldn't be happier!!! Also ur DJ was brill! It was so easy for us to book it all as a package and for it all to sound class and just as we wanted! Absolutely fantastic band,very professional and great craic,really made our wedding day! Nighthawks Wedding Band is feeling thankful at Tullamore Court Hotel. Big shout out to Kevin and Nicola who celebrated there wedding day yesterday in the Tullamore Court Hotel, a fab crowd to play for, also to the two Leprechauns who made an appearance on the night and we must not forget young Jake who rocked the night also. Great night at the Westmeath Hunt Ball, they sure know how to party and the new refurb in the Bloomfield Hotel Ballroom looks Amazing. Nighthawks Wedding Band shared a post. The Tullamore Court Hotel Wedding Showcase takes place on Saturday 2nd February, 2019 between 1-3pm. Come along and view our elegant wedding venue, chat to our highly acclaimed wedding advisor Donna and sample some delicious gourmet bites. Wedding bands The Secrets and Nighthawks will also be showcasing their music on the day. To all you newly engaged couples out there. You are invited to come along to our showcase in the Tullamore Court Hotel on Saturday 2nd February at 1pm sharp. We will be joined by our good friends "The Secrets" on the day. Call in and have a chat with us about your special day.Some dates still available for 2019.